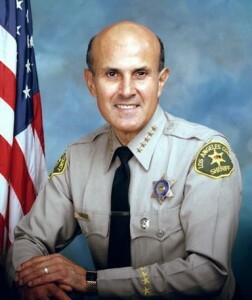 LOS ANGELES – A federal appeals court panel Monday rejected former Los Angeles County Sheriff Lee Baca’s appeal of his conviction on charges of obstruction of justice and lying to the FBI. The 76-year-old former sheriff, who has Alzheimer’s disease, was sentenced in May 2017 to three years in federal prison, but he has remained free pending his appeal. During arguments before the U.S. 9th Circuit Court of Appeals panel in November, Baca attorney Benjamin Coleman contended that the trial judge in the case had abused his discretion by barring jurors from hearing evidence of the former sheriff’s Alzheimer’s disease diagnosis. Baca was convicted on charges of conspiracy to obstruct justice, obstruction of justice and making false statements. During Baca’s two trials, prosecutors described the ex-lawman as being the top figure in a multi-part conspiracy, which also involved his former right-hand man, Paul Tanaka, and eight deputies who took orders from the sheriff. 2 comments for "Appeals court upholds conviction of ex-sheriff Lee Baca"
The best punishment would be for Baca to serve his sentence at the Twin Towers. He can get his Alzheimer’s care there. So his judgment was impaired enough that he shouldn’t be convicted, but no one at the time thought he was impaired enough to say he should quietly step down rather than seeking re-election? That calls into question not just his judgment, but the judgment of those surrounding him.